Lamar Jackson is a football quarterback with the Baltimore Ravens in the National Football League (NFL). He is going at his NFL career shunted behind Joe Flacco the former Super Bowl MVP and the former Heisman Trophy winner Robert Griffin III. 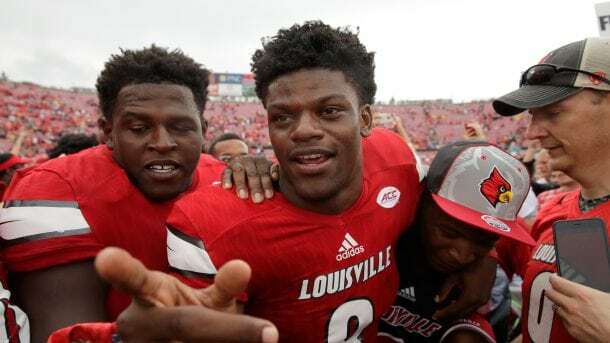 The Baltimore Ravens are preparing him to seemingly take over Flacco’s spot in the future and Lamar Jackson is a hard worker, who is working to see that day come and to carry his team when they need him. Just how is he going to that? The paragraphs below will tell you more about the footballer including what we found in his scouting report. Lamar Jackson was born on the 17th of January 1997 with the full name Lamar Demeatrice Jackson Jr. Pompano Beach, Florida was his place of birth and he went to high school at Boynton Beach High School in Boynton Beach, Florida. In high school, he was rated by Rivals.com as a four-star recruit. Lamar Jackson’s career in high school saw him playing two years of varsity football where he recorded a total of 31 passing touchdowns and 22 rushing touchdowns. He managed to gather a quarterback rating of 102.7 and at the end his high school career having thrown for over 2000 passing yards, Lamar Jackson decided to commit to the University of Louisville. At the University of Louisville in 2015, Lamar Jackson played a total of 12 games and made 8 starts. After he passed 227 yards with two touchdowns, he was named the 2015 Music City Bowl MVP. In his first game as a sophomore, he set a school record when he got eight total touchdowns all within the first half in a match against UNC-Charlotte 49ers. In this same season, Jackson was awarded the Walter Camp Award, the Maxwell Award, and the Heisman Trophy. He was also unanimously selected as an All American in 2016 just as he was also selected by Associated Press in 2016 as the Player of the Year and the 2016 Sporting News Player of the Year. Other awards the lad won include a Louie for Player of the Year in 2016 after the leap he had in a game against Syracuse. He also won a Louie in 2017 and was named the Adidas High-Performance Male Athlete of the Year following his impressive sophomore campaign. He had gotten quite a large fan base and the eye of the media on him as he entered the 2017 season, which was the start of his Junior season. Lamar had his first home game on the 16th of September. College Gameday returned to the University of Louisville to host the match between the Cardinals and the Clemson Tigers. The Tigers dealt the Cardinals a heavy blow with a 47-21 scoreline but Lamar Jackson continued to play to the best of his ability throughout the game even when their loss was obvious. It was this his sheer resilience that led to his returning to New York as a finalist for the Heisman award. By the 2017 – 2018 school year, Lamar Jackson was named as the male ACC Athlete of the Year for all the conference sports. Lamar Jackson announced on the 5th of January 2018 that he was entering the 2018 NFL Draft. He was subsequently picked in the first round of the draft by the Baltimore Ravens as their 32nd overall pick. He made his first regular season appearance on the 9th of September 2018 in a game against the Buffalo Bills and he finished with 24 passing yards in the game which the Ravens won 47-3. He is unique with an ability to beat the defense of any team with his legs or arms. He has plenty of arm strength and a whip-fast delivery even though he was not a full body thrower. He was the best running quarterback in his college days managing to beat defenders to the corner. Lamar, however, had some negative reports like his wrist motion that made the ball sail when he throws or the fact that he bailed too early. Most of his career highlights have already been listed in his college career being that he is a new entrant in the NFL. Nevertheless, as he plays through his career, Lamar is expected to blossom into a robust offensive leader. Lamar Jackson stands at a height of 6 ft 2 in or 1.88 m and weighs 212 lb or 96 kg. His height and weight give him a slim build that helps him stay flexible on the pitch and he is not likely to add any more weight anytime soon as he continues to stay active in the game of football.